10% cashback for BoughtByMany members. Get a quote online! Average quote time is only 6 minutes. 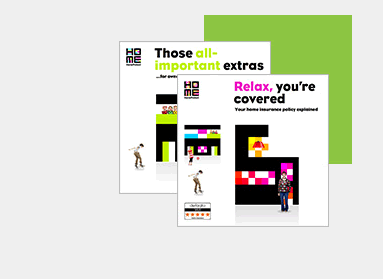 HomeProtect is one of the few insurance providers to provide online cover to customers with non-standard circumstances. Basic home emergency and legal expenses cover included. Earn 10% of your premium back in cash! To qualify for cashback you must click through to HomeProtect.co.uk via the provided link on BoughtByMany.com and generate a new quote and purchase directly online. If you have generated a quote via another site (e.g. a comparison site) or advertisement the sale will not be attributed to BoughtByMany.com and you will not receive the cashback. Offer valid for new customers only. The cashback amount (10% of your premium) will be made to the first named policy holder via credit or debit card refund 60 days after the policy start date. All policies will be run through extensive confirmation checks and cashback will only be paid on valid policies. Your cashback will take up to 60 days to confirm in your cashback account from the start date of the policy (not the date of purchase). If you cancel within this period your cashback will not be paid. Fraudulent Transactions: HomeProtect reserve the right to cancel policies and withdraw cashback should there be a basis for suspicion of fraud or suspect the terms of the offer are being abused. If the cashback is sent and the policy cancelled within 12 months of inception HomeProtect has the right to deduct up to the full amount of cash back, in addition to any administration fees which may apply, from any refund due. If you pay by monthly instalments and in the event that the cashback payment exceeds any refund due then HomeProtect reserves the right to seek payment from you to cover the cost of the cashback. This offer is not available to be used in conjunction with any other offer and this offer may be withdrawn at anytime.